Every feature has been enhanced. 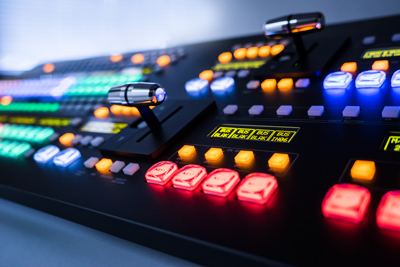 The new HVS-2000 engine is a powerful 6 video M/E machine and a game changer in today's video production switchers. Now with the power in our new HVS-2000 technology, the V6MU engine can be used in a variety of applications. Add the pure power of 6 real M/E's for multiple independent on stage monitor display control or add multiple control panels to operate from a second control room …each with mixes, wipes, keys, DVE including preview control. 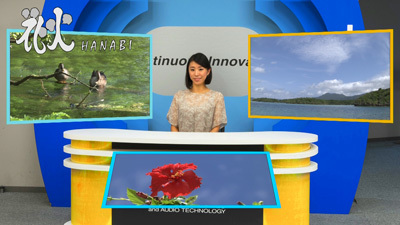 Users of the new HANABI will win the video production race with its high-quality, efficiency, easy operation system. Offers enhanced usability and supports accurate control through color-coded button lights for specific material or button functions, a built-in 7-inch mini menu touch panel with thumbnail display, button/macro bus macro name display, and more. Direct input via a three-axis (XYZ) joystick, dials, and a keyboard. Several user-customizable buttons are available to assign as functions. In addition to two full M/E’s, the switcher includes MELite. With cuts, mixing, wiping, and keying “all with preview” available from four MELite buses. Operators will enjoy the performance of 6M/E’s in a single unit. 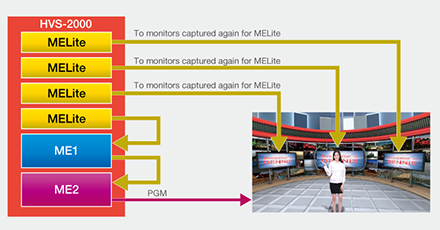 MELite is ready for a broad range of scenarios, such as providing an independent “web cut” output, expanding an operation with multiple control surfaces, delegating M/E resource and even allowing a single operator from a single desk to easily control independent transitions on multiple monitors. Excellent for staging applications. The four FLEXaKEY system can be freely assigned to M/E 1, M/E 2, or MELite (AUX output). When assigned to M/E 2, up to eight keyers (4 keys and 4 FLEXaKEY) can be combined. DVE is available for FLEXaKEY to generate multiple P-in-Ps. FLEXaKEY can also be assigned to an MELite bus and Advanced Aux as an upstream keyer, and to multiple AUX buses to change each with keying output. Useful in many scenarios. Besides standard inputs and outputs, six expansion slots enable you to add optional I/O cards for easy in-field expansion. Easily incorporate an array of content from PC sources (such as PowerPoint, videos played on computers, webcam images, or Skype calling screens) and combine it with broadcast material. Even analog composite I/O can be added. 2.5D DVEs enable free arrangement of P-in-Ps in a 3D space using global axes. Also combines exceptionally well with 3D content, as with virtual studios. Flying key, which moves titles with DVEs applied, is available from all DVEs and can be assigned to all resources in any M/E, whether PGM, PST, or KEY 1-4. P-in-Ps are available in a variety of other shapes besides standard shapes such as quadrilaterals, and can be used in live sports coverage, for example. The switcher’s 3D DVEs include page turn and other warping effects. 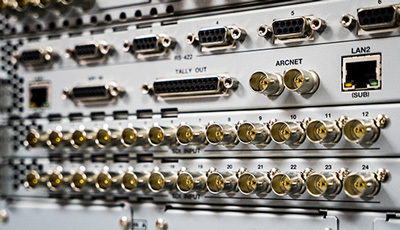 Systems supporting 3 Gbps 1080/59.94p or 50p and even 4K are a requirement today in many operations. 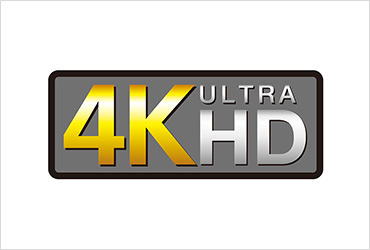 Rest assured that the HVS-2000 is ready today or for your future upgrade plans.